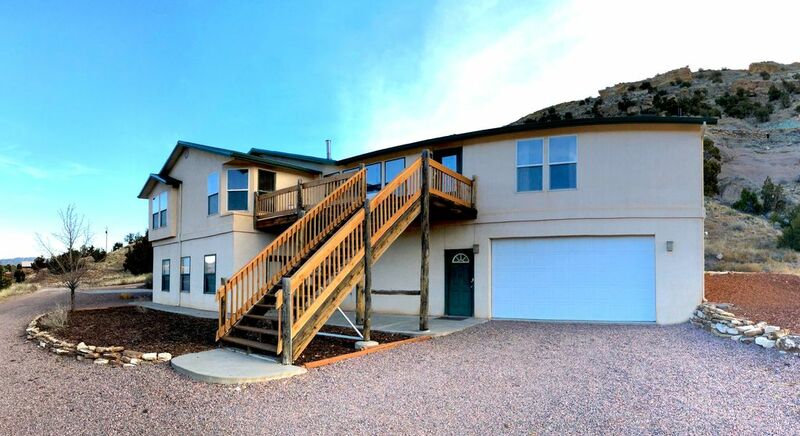 Great house within minutes of the Royal Gorge Bridge, rafting and fishing on the Arkansas River and much more! The house is on a private 150 acre property...very private area! Sleeps 8-10 comfortably. Spacious master bedroom has a queen size bed, jet tub, double sinks and shower. Two bedrooms have queen size beds and share a jack and jill bathroom with a shower. Last bedroom has a full size bed and has a full bathroom across the hall. Kitchen is fully furnished. Large living area is equipped with a full size futon if needed. 2400 Square Feet of great living space, and incredible mountain views! *Basement and garage are unfinished and not available for use (not under renovation currently). As this is an allergen free home, an additional cleaning fee is required for those staying with pets, please inquire. If you do not inquire and bring pets without notifying the owner, a $300 Cleaning Fee will be deducted from the damage deposit. Everything was perfect...location, house, amenities, views, cannot say enough. My family travels quite often and this is by far the best place we have ever stayed. No neighbors which is wonderful. We grilled every night we were there. Super clean! My husband now wants to buy a home out there (LOL). My son attends the Air Force Academy in Colorado Springs so I can definitely say, if this is available, we will be renting every year for Parent's Weekend...and some!! Had I known I could book a rafting or fishing trip next door to the house, I sure would have. But we had already booked about 5 miles down the road. Grocery store, liquor store and gas station were convenient and close by. Don't second guess this place, it is wonderful!! Only thing I got mad at myself about was...I have to sleep with a fan and we didn't use one bedroom and on the last day, my son got nosey and looked around and found not one but TWO fans in one of the bedroom closets. Ugh!! I wish I would have known--My fault! Oh--one last thing--Skyline Drive right behind the house---Must take the drive. Breathtaking but if your afraid of heights in any way, you may want to skip. We had a cop following behind us and I nearly got out and asked him to drive us back down the mountain I was so scared. But was well worth the short drive/view!!! Again, I will be back for sure!!! LOVE IT!!! Can’t say enough about the owner of this property. There was a small hiccup the day we were supposed to check in and he called us before check in to notify us. He remedied the issue very quickly and did everything he could to make us feel at home. The property is very nice and has everything you need. Very close to all the attractions of Fremont County. Would absolutely stay again. We had a great time. The house was close to everything in town as well as rafting and the railroad. We also enjoyed just spending time relaxing in the house. It was very comfortable for all of us. Taylor checked on us to make sure we were okay when a fire started on the mountain across the highway. We would definitely stay here again. We recently stayed at this property and I could have not been more pleased. This house was really nice on the inside, spacious, and furnished with everything you would need. The view was amazing while sitting on the front and back deck. It's location was great, just a few minutes from the Gorge and Canon City. You get all these things for a decent price. It's a perfect place to stay for a family vacation. I would highly recommend this property to anyone. Beautiful, clean, accommodating and overall a wonderful stay. Staying at this property was the perfect place for our Christmas visit to Canon City. With only 6 guests it was spacious and nice. The light is beautiful and the the house is clean and easy to use. We even had some mule deer visit which was a special treat!!!! Thank you for your visit! Happy Holidays, and we can't wait to host you on a future trip to the area! The property was a perfect lay out for our family. Location worked well for our planned activities. Would stay there again. The Skyline House at the Royal Gorge is located in the lower Royal Gorge Valley in the Wet Mountains. This convenient location is five minutes from the world famous Royal Gorge Bridge, the Arkansas River recreation area, Bighorn Sheep Canyon and the city of Canon City. Recreational activities are second to none and include world class fly fishing, white water rafting, parachuting, mountain and road biking, and hiking. Quaint Canon City offers numerous dining options, including Royal Gorge Brewing Company, Le Petit Chablis, and local favorite Merlino's Belvedere. Take a ride on the scenic Royal Gorge Route Railroad and zip line at the Royal Gorge. A truly ideal location for the outdoor enthusiast and/or families.